I watched this movie with my two daughters and they simply loved it! With music and some actors that they both know from the Disney Channel, they were drawn in from beginning to end. In watching this I have to say that though the plot was somewhat predictable, the music was fun and you get drawn into the relationships of the characters. There also is a grease/west side story-esque quality of the movie with the turf war between the bikers and surfers which was fun. You also get a lot of stereotypes placed on certain types of characters and I was able to have a great conversation about these after the movie was over with my daughters. 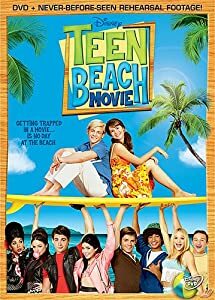 This is definitely a throw back to some of the beach movies of the 1960's and though my kids never saw these, they loved this and know it will be one that will be watched over and over again (I have already been told as much).